Nimona is a plucky enthusiastic young shapeshifter who walks a fine line between adorable and terrifying. Showing up out of nowhere she attaches herself to a gentlemanly super-villain and propels him into a more aggressive campaign against the oppressive Institution that governs the kingdom. The problem is Nimona may be too powerful and aggressive for the sort of overly formal villainy practiced by Lord Blackheart. Noelle Stevenson is one of the co-creators of the Lumberjanes series, but the quality of Nimona leaves Lumberjanes in the dust. 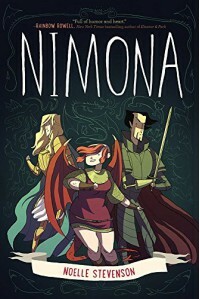 If you enjoy humorous adventure stories with unexpected depth you should try Nimona.